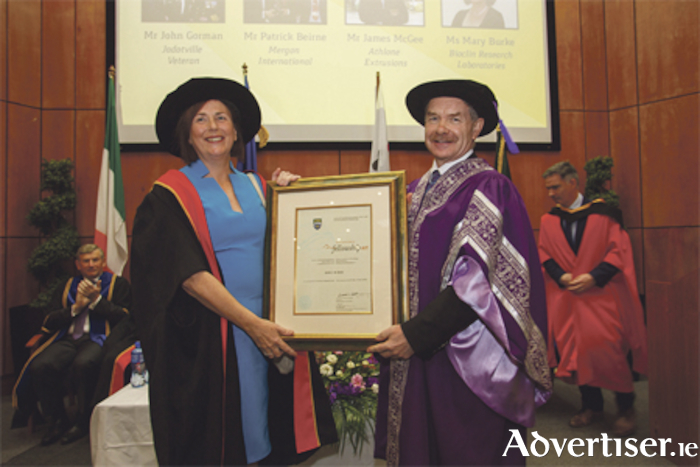 Athlone Institute of Technology (AIT ) presented its highest academic honour to four local figures at a ceremony held last Friday, April 27. Jimmy McGee of Athlone Extrusions, Mary Burke of BioClin Research Laboratories and John Gorman, Jadotville Veteran, and Pat Bernie of Mergon International, Castlepollard, were presented with Distinguished Fellowships, recognising the immense contribution they have made through their life’s work. This prestigious award is the institute’s highest honour and pays tribute to individuals who have made contributions to society, Ireland, the Midland region, the local community or to the development and advancement of AIT. Jimmy McGee was the first to receive his fellowship for his contributions to Athlone through the running of Athlone Extrusions. “While Jimmy may no longer be involved with Athlone Extrusions, we know that at his core he is a serial entrepreneur, and I’m sure there is another chapter in his story to come yet. We hope that our relationship continues into the future,” commented Professor Ó Catháin. The second recipient was Mary Burke of BioClin Research Laboratories. Dr Don Faller, dean of the faculty of science and health, delivered the citation, which acknowledged Mary’s contribution to the pharmaceutical sector in Ireland. The third award was presented to John Gorman, one of the hero soldiers of Jadotville, who has campaigned tirelessly for the recognition of Irish soldiers who were taken captive while serving in Africa in 1961. President Ó Catháin noted that the criteria for awarding the fellowships includes that the nominees have achieved distinction in a field of human endeavour to such an extent as to provide motivation and inspiration to the general public. John Gorman, he said, ticks all of those boxes. Breda Lynch, industry programmes and technology transfer manager at AIT, delivered a citation for Mr Pat Bernie of Mergon.